Once the task for examining the soil is completed by an engineer, the footings for your new dream home are arranged. The foundation work starts as soon as all the suggestions provided by the soils engineer are enforced. Spread – A spread footing footing is set to support an individual column. The shape of a spread footing is circular, square or rectangular slab with uniform thickness. Integral Footings – It is developed into a monolithic slab. Fundamentally the slab and footings are single component which are poured simultaneously. Gravel or Crushed Stone – In some situations, similar to wood or manufactured foundations, a stone footing is effective in spite of concrete. No Footings – If the ground contains a very high load-bearing strength, the foundation wall is set directly on top of the uninterrupted, natural soil or rock. Here, detail information is given on checking plans. Check Plans: It’s very crucial to deliver proper version of your house plan to the contractor for setting up the footings. If any modification is done, ensure that the contractor possesses the updated version. If a couple feet is added to the family room and your footing contractor contains the old plans, a great issue will arise while framing the home. You or your builder consultant should examine the plans as well as the forms for the footings in detail to ensure they are setup with adherence to the plans. 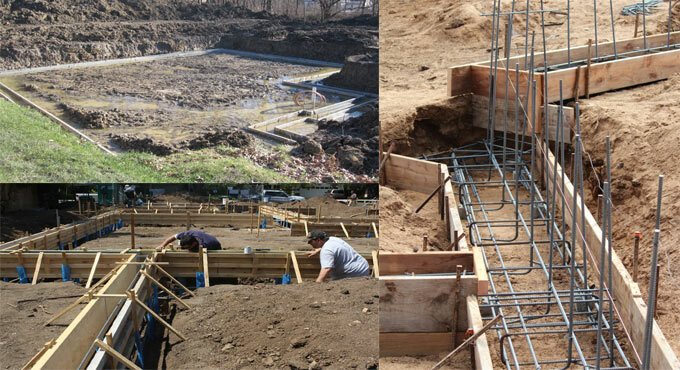 From rebar reinforcements to overall dimensions, it is not easy that the footings will match with the house plans. It is also required to cross reference the engineered plot plan with the forms to ensure that they remain in the proper location. Verify with your footings contractor to check the depth of the footings with a fixed point of reference. Label the elevation of a fixed point of reference by a surveyor. In several situations, this is the curb. A laser level should be used by the contractor to verify the depth of the footings is kept in proper position. The following problems may arise if a home is set just twelve inches too low or too high. Yard Drainage – If your home is developed too low, there may be runoff of storm water. The water will be clogged in the yard and produce basement moisture problems. Water in Garage – If a home is set too low, negative slope on the driveway is formed and the water will run down the driveway and into the garage. Expensive Fill – If your home is set too high, it is required to truck in fill dirt to arrange the grade around your home. It becomes very costly. Slippery Driveway – If your home is situated in a cold climate, and the driveway is stiff, it becomes complicated to utilize the driveway in icy, cold weather.